Congratulations to all of our August giveaway winners! Wool dryer balls are used in place of conventional dryer sheets to help reduce static, drying time and soften your clothes. They are also cloth diaper safe and The Green Belle Shoppe sells them in a variety of colors and scents. 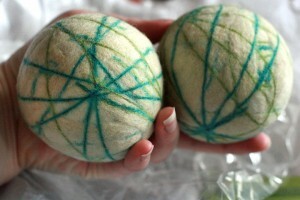 If you weren’t the lucky winner, you can buy extra-large wool dryer balls at The Green Belle Shoppe by Shelly Rose Designs on Etsy for $17 for a set of two. Follow the Shelly Rose Designs blog through Google Friend Connect, or subscribe to the RSS feed in a reader or by email (1 entry for each). Like Shelly Rose Designs on Facebook. Lonely Girl, Gracious God is a book one woman’s attempts to balance her life with four children, a husband and one child who is autistic. This book is meant to be inspirational and the author has even written stories published in the Chicken Soup for the Soul series. If you weren’t the lucky winner, you can purchase Lonely Girl, Gracious God on Amazon, where it’s currently on sale for $11.89. Like Lonely Girl, Gracious God on Facebook. Amy says: Visited the site. I really need to [read] Eat by Choice, Not by Habit… I struggle eating the way thats best for me. 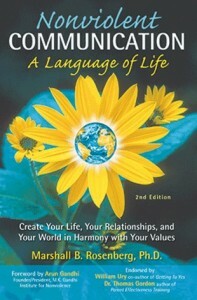 Nonviolent communication is a way to express ourselves thoroughly but without judgement or accusation of another. It teaches understanding, empathy and how to become more conscious of our own reactions and responses to those around us. Code Name: Mama and Natural Parents Network posted an online discussion of this book complete with questions that you can review here. If you weren’t the lucky winner, you can still purchase Nonviolent Communication on Amazon ($11.12 new plus free shipping for Prime customers! ), straight from PuddleDancer Press ($13.95, or as low as $9.95 if you buy multiple books), or check into one of your locally owned/independent book sellers. Subscribe to the NVC eNewsletter. Subscribe to the free Compassionate Parenting Free Weekly Tip Series. The book, What Not to Say focuses on overused parenting phrases like, “Because I said so!” and “Good job!” in an effort to teach parents to be more mindful of what they are saying. The book is short and easy to read, giving numerous ideas on what to say instead and offers children’s books titles to help with relative feelings to those situations. You can buy your own copy of What Not to Say on Amazon for $12. 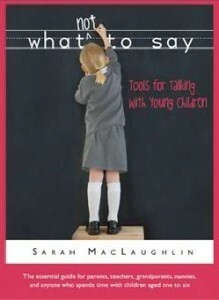 Visit Sarah’s website, read the What Not to Say PDF excerpt, and tell us one thing you learned. Like What Not to Say on Facebook. Follow @SarahMacLaugh on Twitter and leave your Twitter name in the comment. The Episencial company creates green products that can be used by the whole family. They use solar power in their manufacturing and sustainable, recyclable packaging for their products. Their goal is to make affordable, all-natural skin care. If you weren’t the lucky winner, you can use the Store Locator to find Episencial products in a retail store near you. 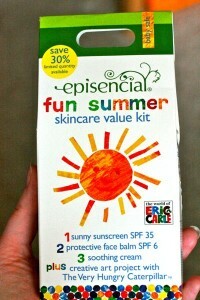 You can also purchase Episencial skincare items at various online retailers such as Diapers.com or Drugstore.com. Besides sunblocks, Episencial also sells other bath and skincare items for children and families. Subscribe to the Episencial Blog. Sign up for Episencial email updates (enter your email address at the bottom of the page next to the green “Subscribe” button). Like Episencial Skin Care on Facebook. 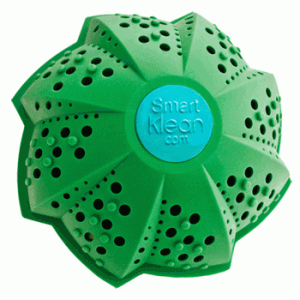 The SmartKlean Laundry Ball is used in place of detergent, cleaning your laundry without any chemicals whatsoever. Each ball is filled with ceramic beads that contain different combinations of minerals to create a molecular reaction that cleans your clothes. If you weren’t the lucky winner, you can purchase a SmartKlean Laundry Ball for $45. Natural Parents Network readers can receive free shipping on their order by using this link. Subscribe to the SmartKlean blog by e-mail (right hand sidebar of their blog). Disclosure: Many of our reviewers receive free products for review. Others purchase those products on their own. Most links are affiliate links.